CRINCH! #CrabOfTheDay for 06/06/2017: Macropodia tenuirostris, also known as The Slender Spider Crab, is a ridiculously long-limbed species of family Inachidae crab known mainly in European Atlantic waters. This vaguely triangular crab has several lobed banks of setae on its carapace, used for securing bits of plant matter as a means of camouflage. Seldom larger than 11 millimeters in body breadth, (about ½ inch) this crab can extend its limbs for a spread of over a foot! With the exception of mating, Slender Spiders live a solitary lifespan 3 to 5 years. Photo Credit: Nahuel E. Farias. The purple stone crab seminal receptacles are huge, probably the largest (relative to their size) of any described crab species. CRINCH! #CrabOfTheDay for 06/17/2017: The Lesser Seaweed Crab (Notomithrax minor) is the smallest of the four Notomithrax species (minor, spinosus, peronii, and ursus) found in Indo-Pacific intertidal zones. A New Zealand native, N. minor is a small family Majidae crab, prone to attaching bits of seaweed to its carapace via setae, as a means of camouflage. Seldom larger than 35 mm (about 1 1/3 inch) across the carapace, this diminutive spider crab seldom strays very far from its chosen rockpool. Unfortunately in recent years, this Filhol-described (1885) crab has played havoc on greenlip mussel farms! CRINCH! #CrabOfTheDay for 06/18/2017: Halicarcinus innominatus, or The Pill-Box Crab is an extremely distinct family Hymenosomatidae species found on the shallow coasts of Australia, New Zealand, and Tasmania. 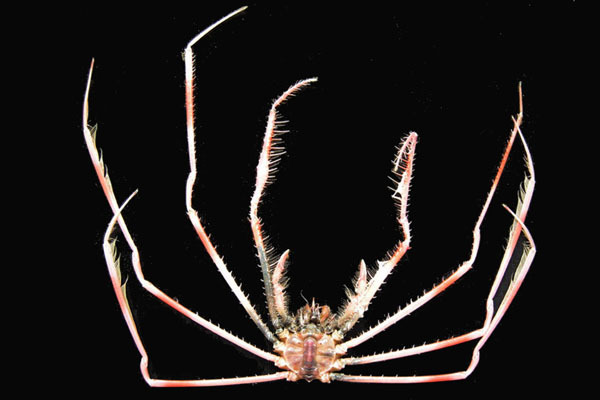 This distant spider-crab-cousin has an angular carapace with numerous billowy patches of setae and banded legs. Typically yellow, green, orange, or shades nearing black- H. innominatus lives in Algal beds and rocky pools where a plant-based meal is easy to come by. Photo Credit: Bit Figs/Culture Pirates. CRINCH! #CrabOfTheDay for 06/19/2017: The BIT-FIG Crab is everything I could want in the realm of tiny plastic pixilated crustaceans! The Glyos-system compatible product of Glyos, Culture Pirates, and Destroy Babylon’s (the band!) very own Marc (don’t forget John either!) Beaudette, these mini-crinchers come in a 5-pack with their companions BitGull, BitFish, OctoBit, and SharkBit. Part of the Bit Figs Animal ‘Series 2: Marine’ run, BitCrabs come in a pretty wide range of mostly random colors! 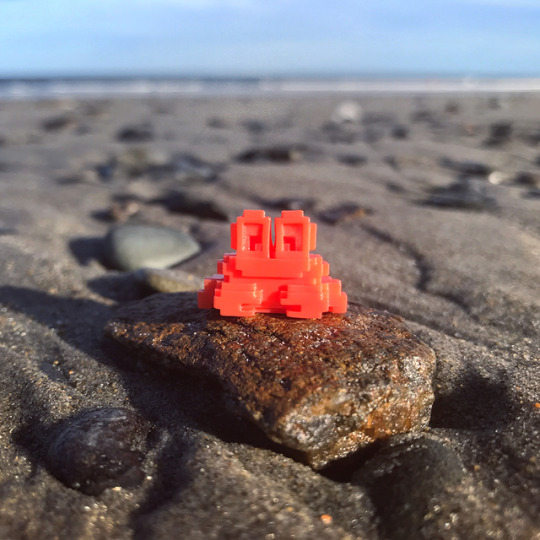 So check out bitfigs either online or at your local gumball machine spot, and while you’re at it, give the #CrabOfTheDay recommended DESTROY BABYLON a listen! CRINCH! #CrabOfTheDay for 06/21/2017: Platymaia turbyneim called The Collapsed Spider Crab, is an Indo-Pacific species of family Inachidae crustacean found in Mozambique, South Africa, Delagoa Bay, Réunion, Durban, and Natal. This gangly crab flattens itself in the fine sand and silt at the 200 m +/- depth zone. (This species had actually been spotted at upwards of 600 m in depth!) P. turbyneim was first catalogued by British zoologist, Reverend Thomas Roscoe Rede Stebbing FRS/FLS, in 1902. CRINCH! #CrabOfTheDay for 06/22/2017: The Caribbean Spiny Lobster, or Panulirus argus is a species of marine Langostine (Spiny Lobster) found in the Atlantic, namely the West Indies, Florida, Cuba, and The Caribbean. A frequently commercially harvested and farmed species, Caribbean Spinies look like your average lobsters in both morphology and size, but have two large forward-pointing "horns" above their eyestalks rather than claws. P. argus primarily feeds at night, as in addition to humans, various fishes, sharks, and octopi find it delicious too! 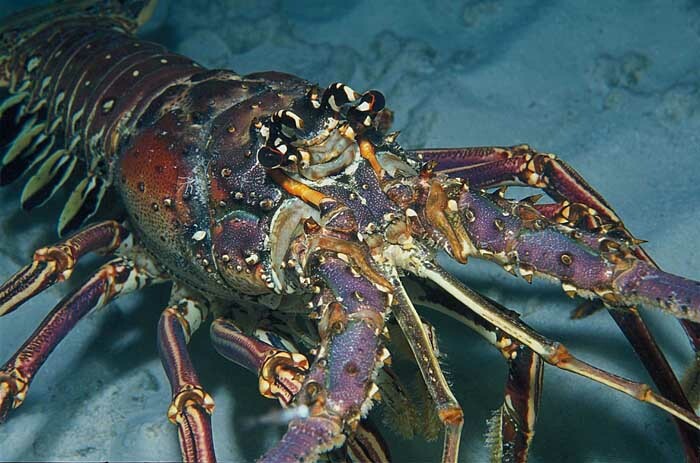 Caribbean Spiny Lobsters migrate in fall by forming a line of hundreds and marching across the seafloor. CRINCH! #CrabOfTheDay for 06/23/2017: Charybdis (Goniosupradens) obtusifrons, called Leene’s Swimming Crab in the biz, (Also “Madara-ishi-gani- modoki“or マダライシガニモドキ in Japanese.) is an Indo-Pacific species belonging to family Portunidae, subgenus Goniosupradens. Prolific in Réunion, Madagascar, The Red Sea, and Polynesia, C. obtusifrons has distinct ordered rows of curved spines and stunning iridescent blue patches on its margin edges. Like most swimming crabs Leene’s swimmers are semi-predatory. 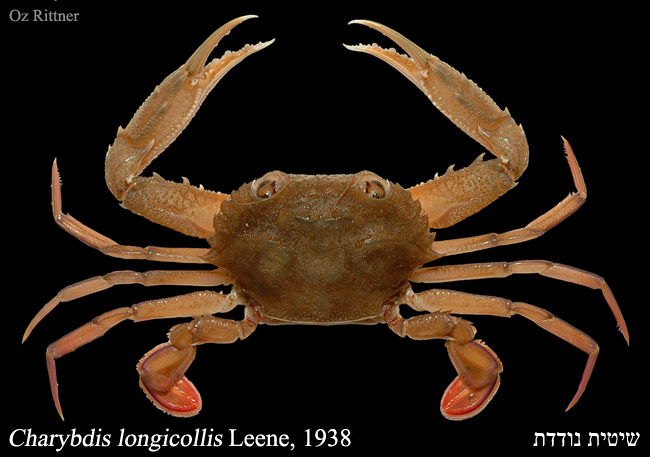 This species was first catalogued AND named after Dutch zoologist, Jentina E. Leene, who in her time was widely regarded as the premier authority on the swimming crabs of the genus Charybdis. FUN FACT: "Charybdis" is Greek for whirlpool. CRINCH! #CrabOfTheDay for 06/24/2017: Zozymodes pumilus, or The Chagos Reef Crab is a diminutive Xanthid found in Indo-African/South Pacific waters, namely the Chagos Islands, (for which it is named!) Somalia, Seychelles, French Polynesia, and other parts of Asia. Z. pumilus has a thick, divided carapace, extremely unequal lobed claws, and is colored with variable light and dark patches. Though sparse, this little species has distinct setae on its walking legs, most likely used for the purpose of detritus/food collection. The Chagos Reef Crab was first catalogued alongside many other crab species’ in 1846, during the Hombron & Jacquinot expedition. CRINCH! #CrabOfTheDay for 06/25/2017: Panulirus versicolor, or The Painted Spiny Lobster is a fabulous-looking species, known throughout the Indian Ocean, East to Japan, Micronesia, Melanesia, Polynesia, Northern Australia, and in isolated populations in the U.S. Mid Atlantic. A shallow-water dweller, this beautiful Spiny Lobster (often called the blue spiny, or the painted crayfish) is named for the BRIGHT blue stripes on its legs, greenish-blue carapace, and reticulated blue and green pattern on the carapace margin and tail fins. 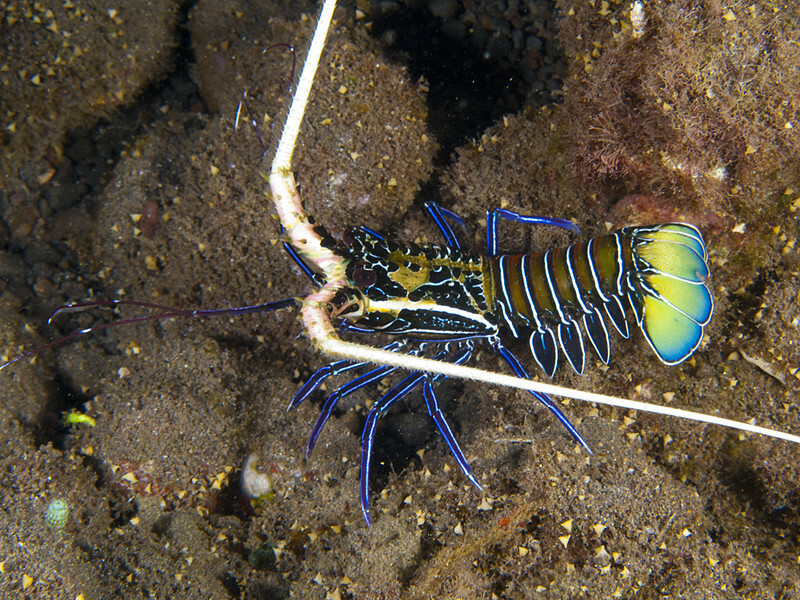 Like all ‘spiny’ lobsters, P. versicolor has two long antennae-like spines instead of traditional claws. Though many populations of this animal were introduced, some in invasive fashion, the Painted Spiny is treasured as both a delicacy and an aquarium addition. Generally peaceful to all but its immediate bottom-dwelling competitors, P. versicolor warns off most conflicts by making a sound that is very similar to a cicada. (locust) Additionally, these crustaceans may perform a dance-like maneuver, whipping its long, split white antennae as it moves back and forth across an area. CRINCH! #CrabOfTheDay for 06/28/2017: Diogenes senex, or The Minamitsu (ミナミツノヤドカリIn Japanease reads “Minamitsu no yadokari”) Hermit Crab, is a widely distributed Indo-South Pacific species of family Diogenidae hermit. This Heller-classified species (1865) has been the source of much taxonomic confusion, being just similar enough to other crabs to be easily misidentified. Common to the Demersal brackish biomes in Australia and Africa, this tropics-dweller possesses a "duck-beak" like spoon-finger, and can readily be differentiated from its cousins by the presence of stripes on the inside tract of its eye-stalks. Because of its relative success, D. senex frequently falls victim to the endoparasites, Athelges aegyptius, Athelges caudalis, and Diogenion vermifactus. Photo Credit: Manuel Gonzalez Acuña. CRINCH! #CrabOfTheDay for 06/30/2017: Platymera gaudichaudii, or The Armed Box Crab, is a Subtropical species of Eastern Pacific family Calappidae crab, found from California to Chile. Called the “Racer Crab” by the San Diego dock fishermen that sell them, these box crabs are a delicacy- often overlooked by inexperienced crab diners as they aren’t routinely sold in grocery stores. Catching these little buggers isn’t without danger, as they possess small but incredibly sharp claws, capable of causing some pretty serious injuries! Additionally, two large spines adorn either side of this crab’s carapace, making it hard to catch at all! CRINCH! #CrabOfTheDay for 07/01/2017: Platylambrus granulata, (Kingsley, 1879) or The Bladetooth Elbow Crab, is a horrid-looking species of family Parthenopidae crab found mainly in the Gulf of Mexico, and a few other distinct Western Atlantic locations. Like other ‘Elbow Crabs,’ this bright red beastie has elongated chelipeds, covered with numerous lumps, spines, and granulate tubercles. Beefy arms aside, this crab has a rounded triangular carapace, and a relatively tiny ‘face.’ Despite its appearance, P. granulate isn’t invulnerable- it is frequently the host of parasitic pedunculate barnacles from genus Octolasmis! Photo Credit: ”Jacksonville Shells” jaxshells.org. CRINCH! #CrabOfTheDay for 07/02/2017: Eriphia gonagra, called The Redfinger Rubble Crab, is a widely distributed Atlantic species of reef-dwelling family Eriphiidae crab. Extremely prolific in the Gulf of Mexico and South America, E. gonagra is adept at hiding in reefs, waiting in ambush for the mollusks, echinoderms, polychaetes, and other reef dwellers it eats! 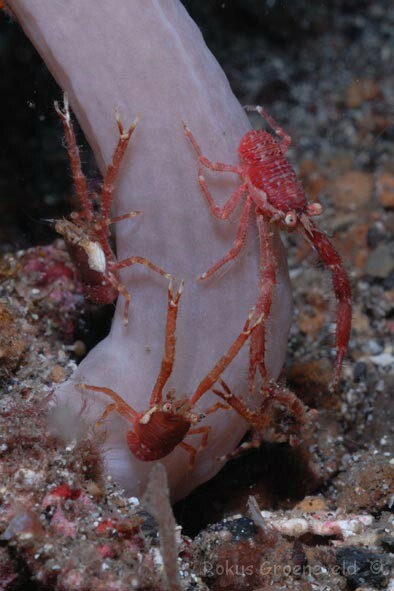 Sometimes the Redfinger Rubble Crab is (erroneously) called the warty crab, a title usually reserved for its cousin, Eriphia verrucosa. Photo Credit: Moorea Biocode, 2010. CRINCH! 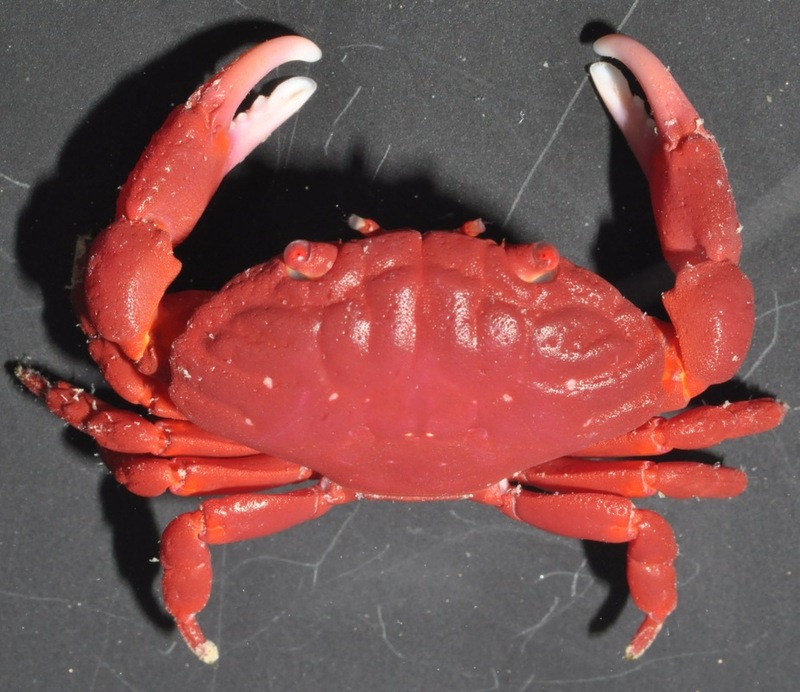 #CrabOfTheDay for 07/04/2017: Liomera venosa, or The Ruby Reef Crab, (formerly Cancer venosa) is a native ‘Round Crab,’ native to Mauritius, Singapore, French Polynesia, and New Caledonia. 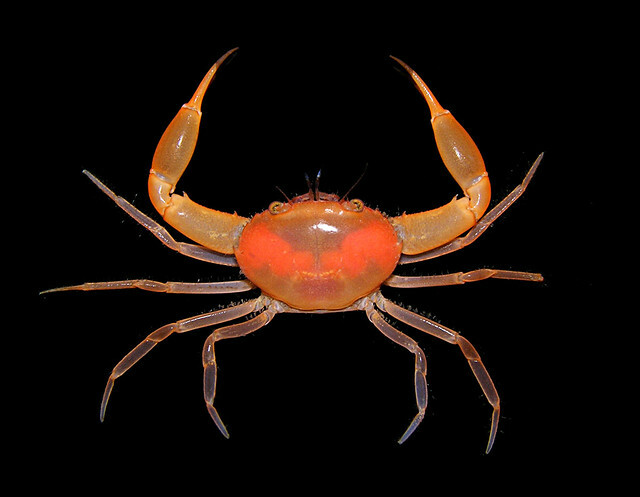 Called “Beniougigani” in Japanese (ベニオウギガニ) and “Mài huābàn xiè” in Chinese, (脉花瓣蟹) this knobby, red crab seldom reaches more than 1-2 cm across. Like many other South Pacific species of round crab, L. venosa is extremely poisonous, because of the crab’s diet of toxic shellfish. CRINCH! #CrabOfTheDay for 07/05/2017: Urnalana purarensis, (Ovaere, 1987) or The Bulbous Purse Crab, is a distinctly round family Leucosiidae species found in Taiwan, Papua New Guinea, Guam, Tahiti, and the Tuamotu archipelago. This shallow water species hangs out in rocky reefs and sand flats, doing its best not to get eaten by larger crabs and crustacean-eating fish. 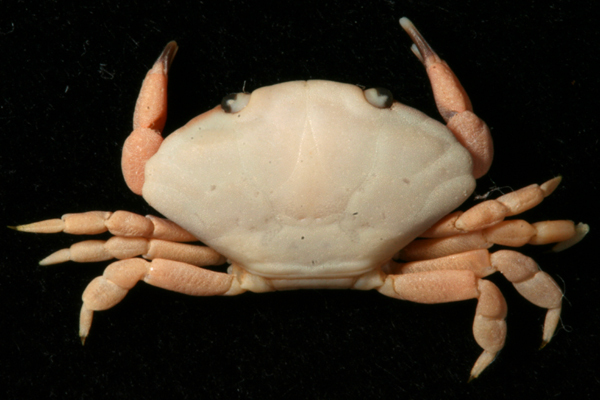 Bulbous Purse Crabs are close cousins to Urnalana flammea (another Leucosiid) but differs in a number of carapace, ambulatory leg and gonopod characteristics. CRINCH! #CrabOfTheDay for 07/06/2017: Geothelphusa miyazakii, or Miyazaki's Crab (Yup, named for THAT Miyazaki!) is a way interesting freshwater species of family Potamidae/subfamily Potamiscinae crab. Native to Japan, Taiwan, and China, this Miyake & Chiu-catalogued species (1965) is facing MAJOR threat of endangerment as large scale development and pollution heavily impact its relatively small (<1000 km² over 8 known sites) geographical range of inhabitation. CRINCH! #CrabOfTheDay for 07/07/2017: LEGO Mechanized Fiddler Crab-01! 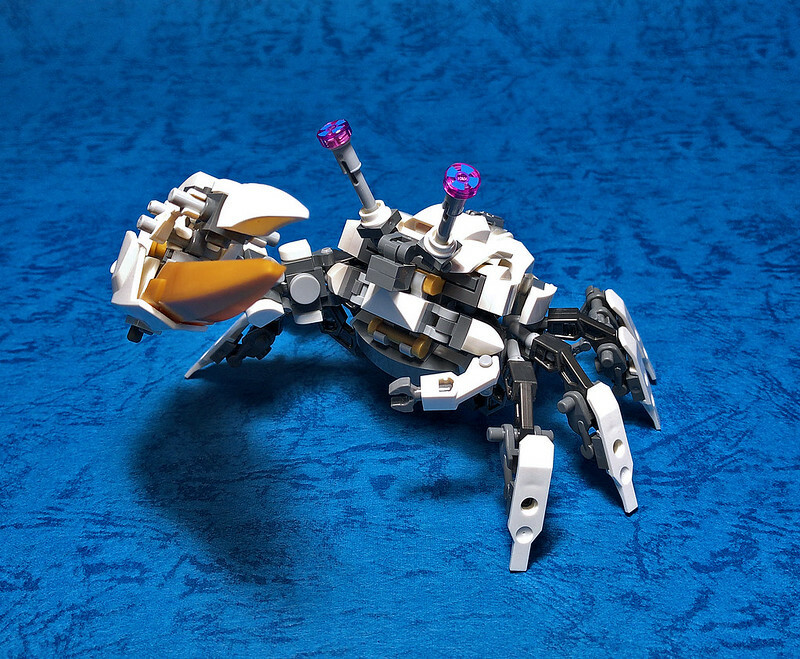 Kurashiki, Japan native, and LEGO building master, Mitsuru Nikaido has created one wild-looking beastie, simply dubbed “Mech Fiddler Crab-01.” This MOC (‘My Own Creation’) is one bang up LEGO mechanical robot crab! With articulated claws, eyestalks, and walking legs, you gotta give credit where credit is due! 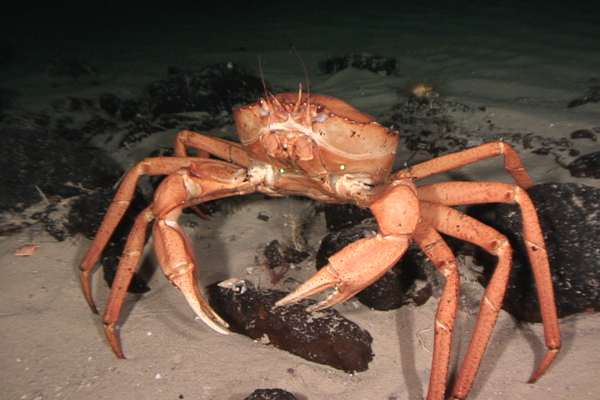 Check out this crab, and many other amazing sea-creature (and land-creature!) themed builds on both the artist’s facebook and flickr pages! CRINCH! #CrabOfTheDay for 07/09/2017: Catoptrus nitidus, called “Haigazami” (ハイガザミ) in Japanese, meaning “Lookout Crab,” (literally ‘high-glance!’) is a great Indo-Pacific Family Portunidae/Subfamily Carupinae species. Found in the tropical sublittoral zone waters off the coasts of French Polynesia, Japan, Guam Taiwan, and South China, this unique species is named because it tends to climb to the highest point of a reef mound to search for meals. This Milne-Edwards catalogued species can be readily distinguished from its closest cousin, C. inaequalis, by the presence of three prominent denticles (tooth-like protrusions) on the lower ollbital margin, a basal thickening of the eyestalks, and a bright (almost neon) orange coloration. CRINCH! #CrabOfTheDay for 07/10/2017: Cymo andreossyi , or The Acro Crab, is an amazing little coral crab found living symbiotically on live Indo-Pacific varieties of Pacillopora, Acropora and Montipora corals. 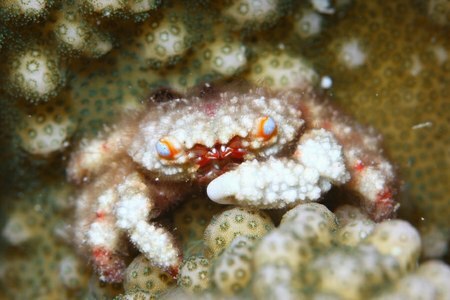 This family Xanthidae crab (occasionally called the “Hairy Coral Crab.”) lives a mutualistic lifestyle with its chosen coral; the coral gains protection and house cleaning services while giving up a few polyps, mucus and captured/settled food particles in exchange for those services. Generally, these drab-colored crabs pose no threat to a coral, but when combined with sickness, and damage from fish/ocean conditions, can stack up to be quite the little pests! CRINCH! #CrabOfTheDay for 07/12/2017: The Thunderbolt Crayfish, or Cherax pulcher is a species of freshwater “Rainbow Lobster” from from West Papua. (Indonesia.) 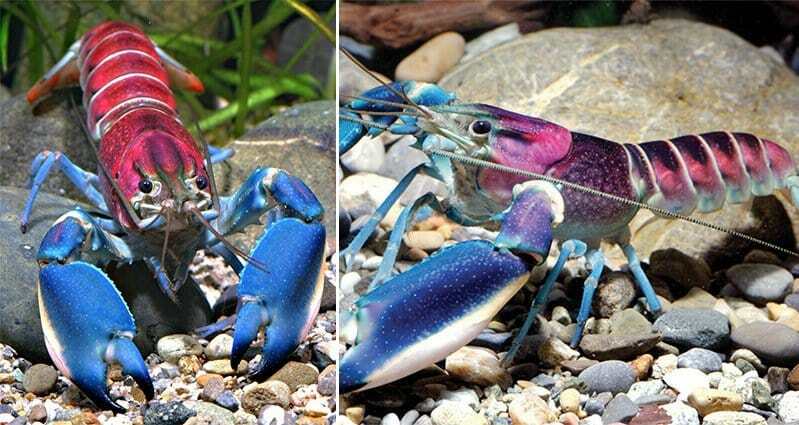 This brilliantly colored crustacean is popular as an aquarium species, also called by enthusiasts “Galaxy Crayfish” and “The Blue Moon Crayfish.” C. pulcher has a pink cephalothorax, greenish-grey-blue on the sides and rostrum, and spectacular speckling, especially on the margins and claws.” A member of subgenus Astaconephrops, (family Parastacidae) these crayfish are highly active, spending a large portion of their time scuttling around, exploring in search of food. As an avid scribbler in the early 80’s, I can attest that my friends and I burnt through his books- especially after one of those monthly book-orders we had at school! Photo Credit: Hsi-Te Shih, 2014. CRINCH! #CrabOfTheDay for 07/13/2017: Leptodius exaratus, The Fan Round Crab, is a widely distributed species of Indo-Pacific family Xanthidae crab, known for its variable coloration and morphology. This lumpy, corrugated and granule-covered crab is easily mistaken for other crabs due to its wide range of characteristics. In 2011, a group working on crab taxonomy & systematic discovered that L. exaratus aren’t as ‘uniform’ as they initially appear to be, and are “actually a complex of cryptic species,” most likely leading to the revision of the entire genus Leptodius. CRINCH! #CrabOfTheDay for 07/14/2017: Chaceon poupini, or The Polynesian Golden Crab, is a family Geryonidae species found in the South, and Eastern Central Pacific Ocean Tropics. Primarily described (by Manning in 1992!) 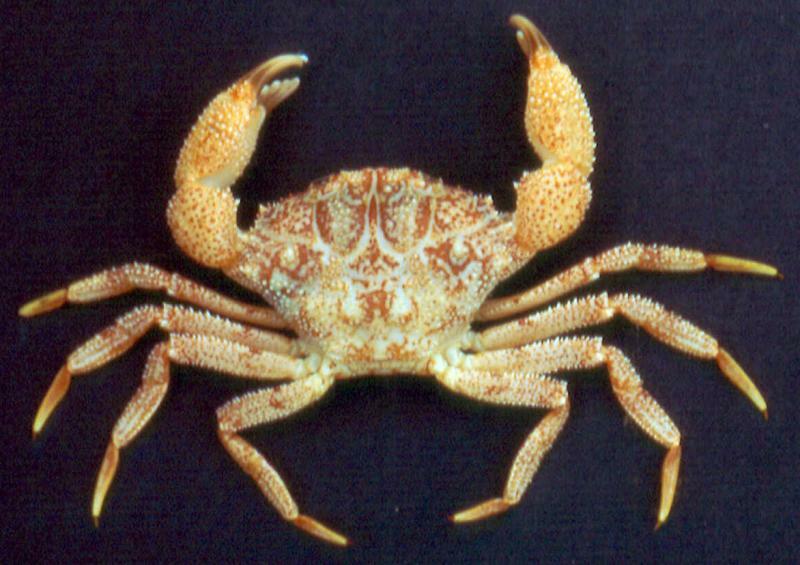 from samples collected in French Polynesia- this crab has been sighted in the waters surrounding Pitcairn, Easter Island, Clipperton, The Marquesas, and several other isles. Seldom achieving a width of greater than 14.0 cm, (around 5 ½ inches) these golden-hued crustaceans inhabit depths 600 m to over 1000 m.
FUN FACT: The Latin suffix ‘poupini’ is in fact a designator given in honor of rockstar French marine biologist Joseph Poupin: member of the Institut de Recherche de l'Ecole Naval (IRENav), GIS research team and main curator of the CRAB DATABASE! Photo Credit: Ocean Blue, 2015. CRINCH! #CrabOfTheDay for 07/16/2017: Cymo quadrilobatus, or The Blue-Eyed Coral Crab, is a delightful little marine species, known for living on hard Indo-Pacific corals in the waters surrounding Somalia, The Indian Ocean, Chagos, Reunion, Madagascar, Mozambique, The Red Sea, Mauritius, The Seychelles, The West and South Pacific Ocean, French Polynesia, Guam, and New Caledonia. These small crabs curate their chosen corals by removing (and eating!) excessive mucus and parasites. It was originally thought that Cymo quadrilobatus was identical to Cymo tuberculatus after encountering a specimen of the former retrieved from a 1899-1990 expedition. Later taxonomic inquiry corrected this! CRINCH! 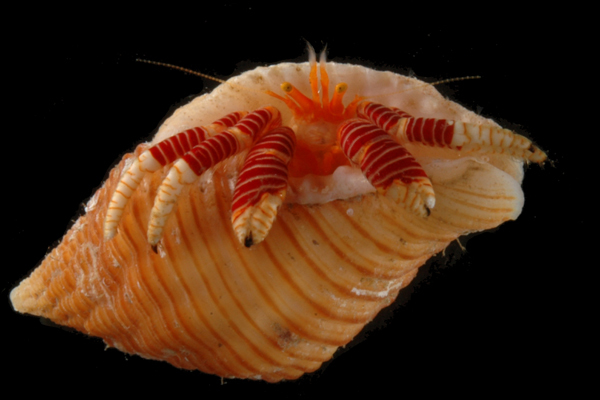 #CrabOfTheDay for 07/18/2017: Ciliopagurus vakovako, The Marquesas Striped Hermit Crab, is a French Polynesian shoreline hermit native to Pitcairn, Easter Island, Clipperton, and most notably, The Marquesas. 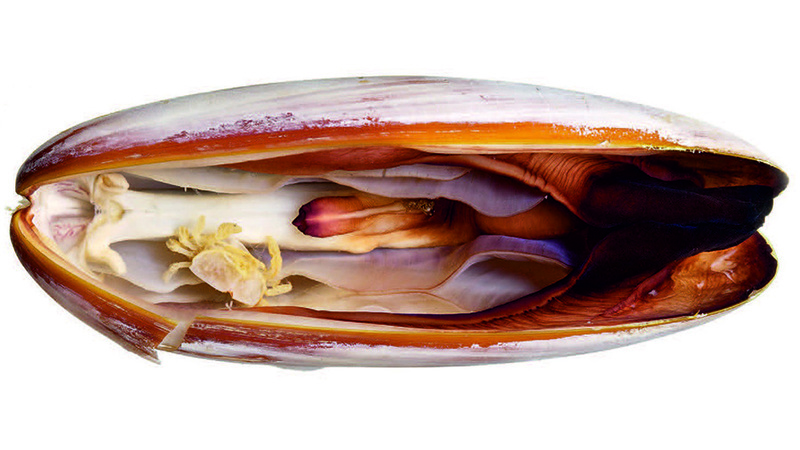 Found on rocky shores from depths ranging 10 m to 60 m, C. vakovako appears to be a distant variant of C. strigatus, a species widespread throughout the Indo-pacific region. (See the second image for a really specific marking breakdown of the differences!) Like other family Diogenidae hermits, C. vakovako typically has a larger Left-Hand than right as opposed to other hermits who have the reverse of this. FUN FACT: The species name ‘vakovako’ is a Marquesan word meaning striped, which is an allusion to the transverse rings on this crab’s legs. CRINCH! #CrabOfTheDay for 07/19/2017: Charybdis (Goniohellenus) longicollis, or The Lesser Swimming Crab (sometimes called Charybdis hoplites longicollis) is a Leene-catalogued species of swimming crab, with a fairly wide global distribution. Found readily in the Aegean, Mediterranean, Black, Red, and Levantine Seas, The Persian Gulf, Indian Ocean, and Suez Canal- this family Portunidae/subgenus Goniohellenus member has matriculated into some rather surprising water bodies via “Lessepsian migration.” (also called Erythrean invasion) This process is used to describe any animal migration over man-made structures, (like canals) i.e. that which would not have occurred had it not been for the presence of an artificial structure. Lesser Swimmers have a hex-shaped body with red to greenish-brown coloration, except for the margins and embossed granules which are paler in color. 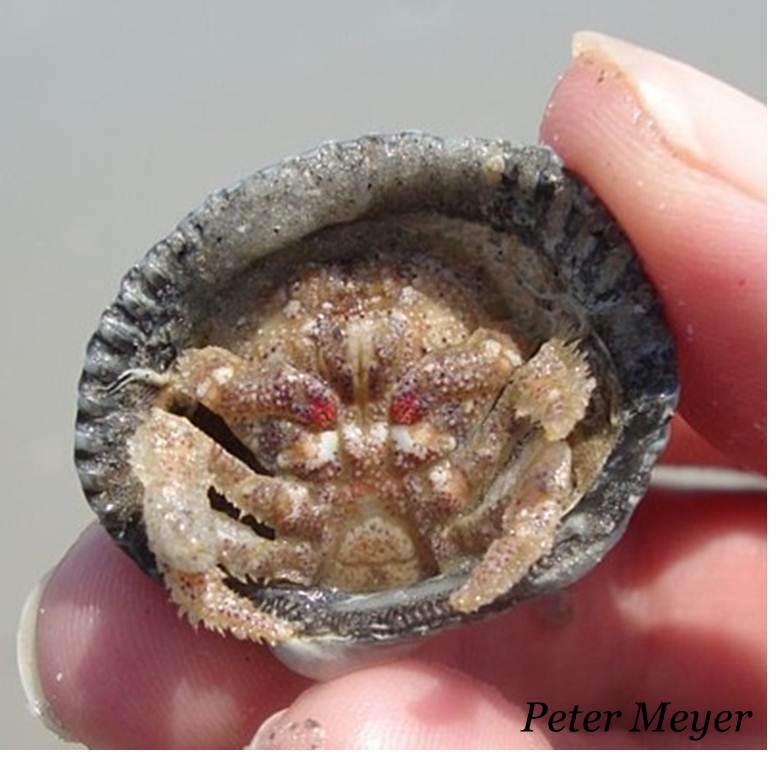 Frequently the host of the Rhizocephalan parasitic barnacle, Heterosaccus dollfusi- this infection dulls the crab’s aggressive/belligerent tendencies, suggesting a strategy to help the host avoid injury, enhancing the life expectancy of host and parasite. CRINCH! #CrabOfTheDay for 07/20/2017: Galathea balssi, The Red Galathea Crab is a family Galatheidae/superfamily Galatheoidea “Squat Lobster” (Occaisionally called The Brown Squat Lobster) found off the coasts of Africa, India, Australia, up to the coral Triangle (Indonesia, Philippines) and into Japan and China. Originally described in 1964 by Japanese rockstar crabfolk, Miyake & Baba, this species typically hangs out UPSIDE DOWN on the underside of rock and coral ledges with its claws fully outstretched to snag tiny meals using the setae that cover them. Dwelling at depths of 40 m – 250 m, this tropical Malacostran is called ‘Barusukoshiorie’ (バルスコシオリエ) in Japanese! CRINCH! #CrabOfTheDay for 07/22/2017: Hippa adactyla, a.k.a. 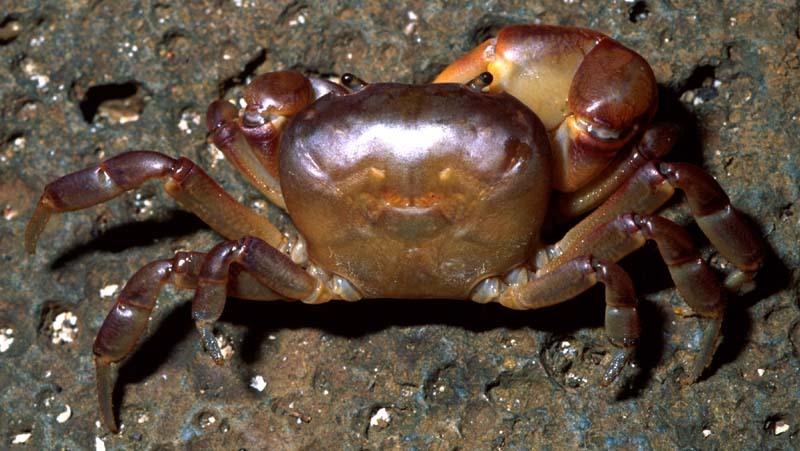 The Turtle Crab is a family Hippidae (Mole Crab) species hailing from Indo-Pacific waters. Though widely distributed, H. adactyla can be found on some very surprising beaches, including Zanzibar, The New Hebrides, The Loyalty Islands, and The Galapagos. Called “Minamisunahorigani” (ミナミスナホリガニ) in Japanese, and “Cè zhǐ chán xiè” (側指蟬蟹) in Taiwanese, these crabs live in burrows dug right at the tide line in the wet, fine sand of a given beach. This is made possible by a ‘Telson’ or digging antennae on the ‘face’ of the crab. Photo Credit: Crosnier & Moosa. CRINCH! #CrabOfTheDay for 07/23/2017: Thalamita macrospinifera, called The Spine-Haired Swimming Crab, is a family Portunidae predatory crab hailing from the Indo-South Pacific, including parts of The Indian Ocean, Madagascar, The Seychelles, Réunion, Australia, and French Polynesia. This small swimmer is VERY infrequently seen, and even when sampled is often confused for other Asiatic Portunids. 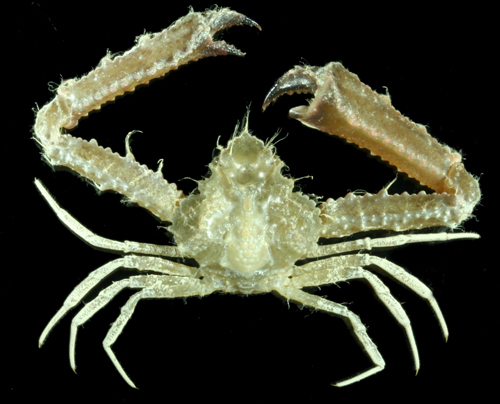 Inhabiting a range of depths from the Sublittoral zone to open deep ocean, the Latin ‘macrospinifera’ (or Large Rough Spines) in this crab’s name refers to the rough-textured row of setae-ended teeth on the front edge of its carapace. CRINCH! 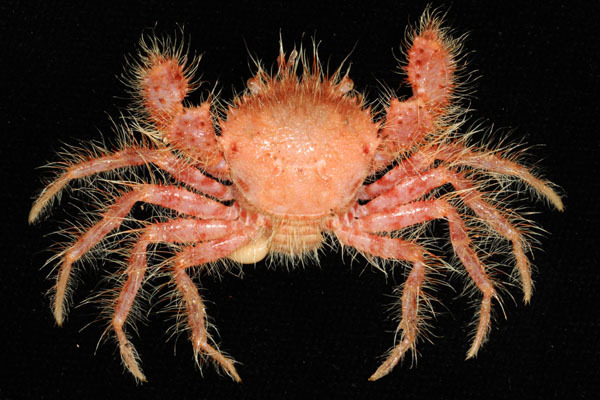 #CrabOfTheDay for 07/24/2017: Pilumnus gracilipes, known as The Tuberculate Hairy Crab, is a family Pilumnidae species known worldwide, yet rarely seen outside parts of the Gulf of Mexico and Southern Australia. This A. Milne-Edwards described species my likely migrated to other waters by man-made means such as boat by-catch and floating ocean debris. Due to its relative rarity, and the ease of misidentification, P. gracilipes remains under intense taxonomic scrutiny! Though it may seem obvious, the Tuberculate Hairy Crab is named for the large volume of setae-covered ‘lumps’ all over its entire body. CRINCH! #CrabOfTheDay for 07/25/2017: Demania garthi, or The Scaly Round Crab is an Indo-Pacific family Xanthidae species inhabiting depths greater than 100 m, (usually 250 m to 300 m) especially near French Polynesia and New Caledonia. Called “Urokoougigani” in Japanese, (ウロコオウギガニ) this Guinot & Richer de Forges species is predominantly reddish-orange, with cream-to-white mainly in the regional margins. This Tropical crab’s common name comes from the ‘scale-like’ granules which cover its carapace. Additionally, its Latin suffix, ‘garthi’ is an homage to late L.A. Crab rockstar, John Shrader Garth. Photo Credit: G. & Ph. Poppe, 2011. CRINCH! #CrabOfTheDay for 07/26/2017: Tiarinia cornigera, (Latreille, 1825) or The Collector Crab, is an Asiatic family Epialtidae/Superfamily Majoidea species found in The South China Sea, Japan, Indonesia, Taiwan, and the Phillipines. In Japanese, this crab is known as “Isokuzugani” (イソクズガニ) and is easily recognizable among related ‘Decorator’ Spider Crabs by an unusually bright red and orange covering of granules, tubercles, and distinct setae of various sizes. Additionally, the Chelipeds are VERY stout in comparison to other Majoids. The EXTREMELY unique setal morphology of T. cornigera promotes a wide biome of micro-organism ‘decorations.’ Clusters of these hollow setae, can be flexed and pumped to create specific water flow zones over its carapace surface. 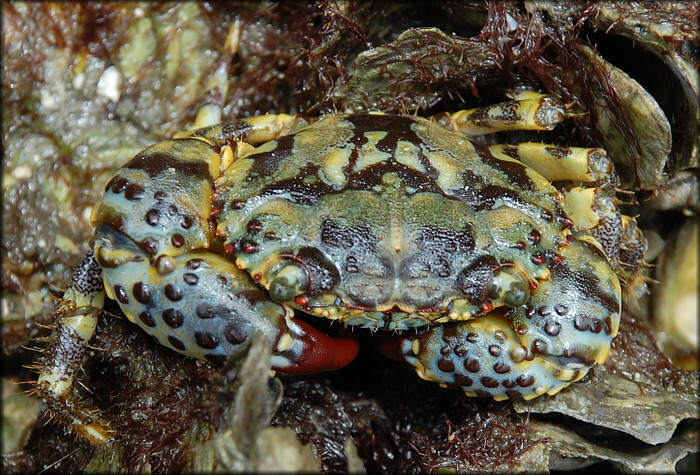 Different flows create conditions for physical or chemical adhesion by the organisms living on Collector Crabs allowing for a hierarchical or ‘active’ camouflage system. CRINCH! #CrabOfTheDay for 07/28/2017: Rhinolambrus pelagicus, (Rüppell, 1830) or The Pelagic Elbow Crab, is a family Parthenopidae species, infrequently found primarily in The Red Sea, China and Japan, The South Pacific Ocean, Wallis and Futuna, and New Caledonia. 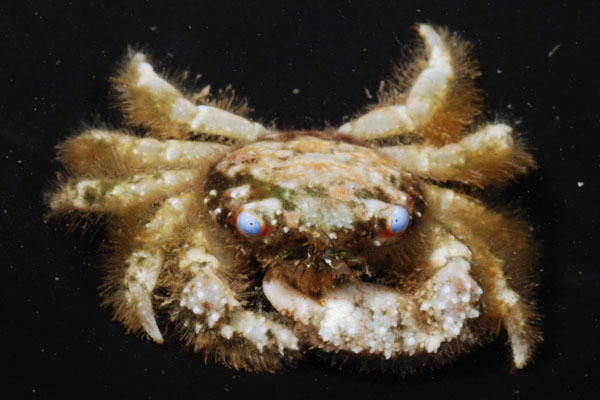 Called “Taiyouhishigani” (タイヨウヒシガニ) meaning “open-water crab” in Japanese, this hard bottom (rock and rubbles) dweller lives at the 50 m to 100 m depth zone, where easy detritus meals and the occasional worm snack are plentiful. 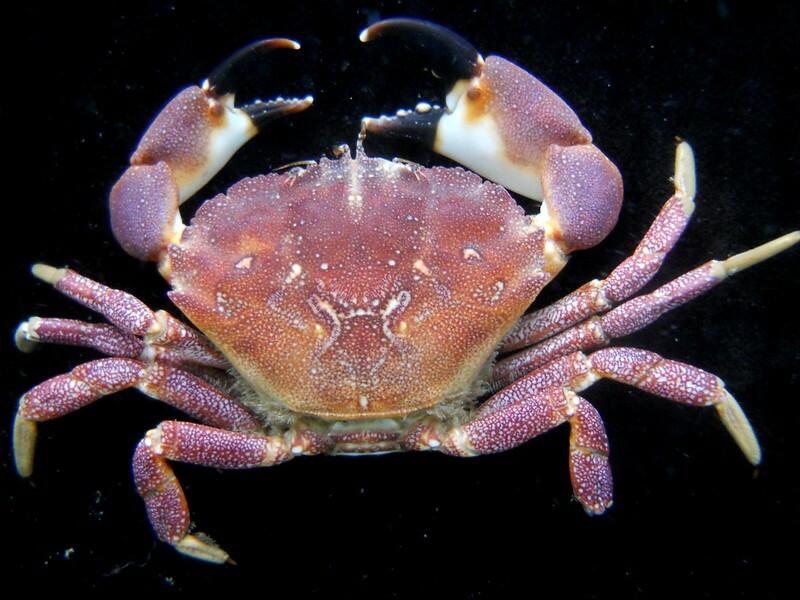 As is usually the case with “Elbow Crabs,” the chelipeds of male are about three times the length of the carapace,while those of female, however, are only 2.5 times. CRINCH! #CrabOfTheDay for 07/29/2017: Ozius truncatus, or The Blackfinger Reef Crab, is a family Oziidae species hailing from the open Pacific- namely East Australia, New Zealand, and French Polynesia. In Japanese this species is called "Isoougigani," (イソオウギガニ) and is common in the region’s intertidal and subtidal zones. 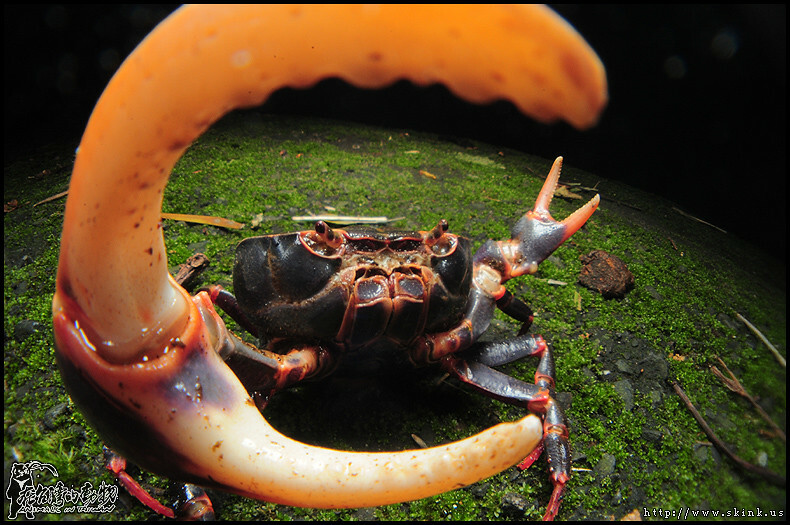 Scavengers by nature, these crabs feed on predominantly dead animals and plants. Obviously named for its black-tipped claws, this usually peaceful crab can do some damage to a given reef (or aquarium) habitat! Photo Credit: Toru Ise Do. CRINCH! #CrabOfTheDay for 07/30/2017: Carupa ohashii, called "Oohashikarupagazami" in Japanese, (オオハシカルパガザミ) is a unique family Portunidae species from Japan and parts of East Asia. 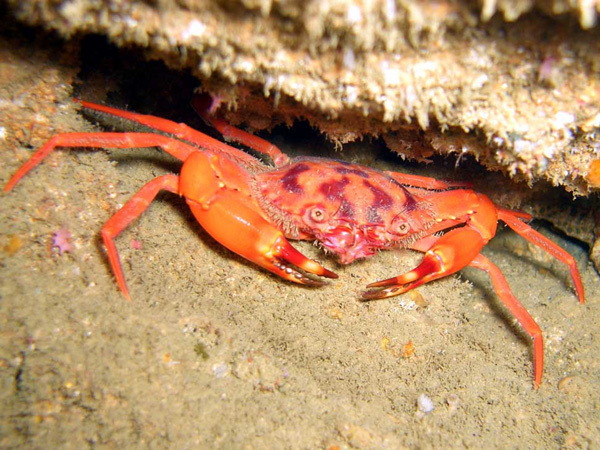 Known as a native Ryukyu Island species, these crabs can usually be found] in submarine caves. 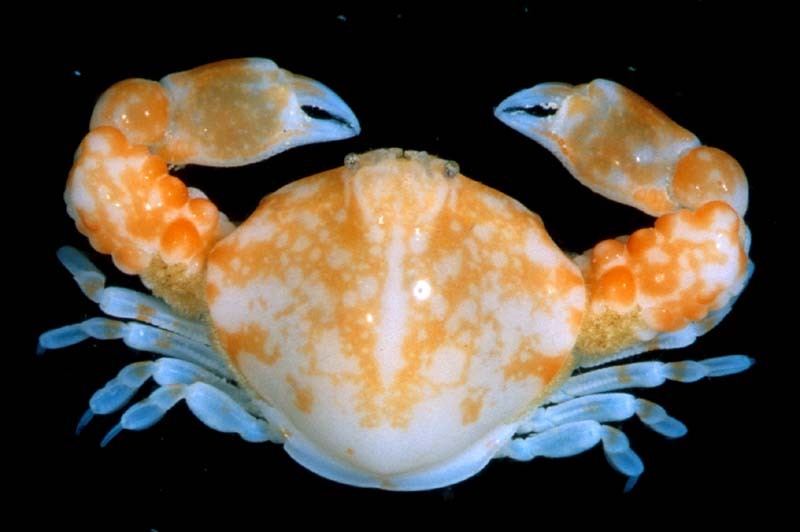 This Takeda (1993) cataloged species can be readily distinguished from other Asiatic swimming crabs by its far narrower carapace, heavy smooth chelipeds. CRINCH! #CrabOfTheDay for 08/12/2017: Cryptodromia hilgendorfi, or Hilgendorf’s Sponge Crab is a small, purple family Dromiidae or 'Spone Carrier' Species found in The Comores, Djibouti, Eritrea, Madagascar, Mozambique Channel, India, The Red Sea, French Polynesia, New Caledonia, and some parts of The South Pacific Ocean. This tiny reef/knoll-dweller will collect a mass of sponges or compound ascidians and carry it with specialized rear-pair inverted velvet-covered legs. As is usually the case with sponge crabs there’s a preferred species of sponge that gets carried; in C. hilgendorfi’s case, it’s the Indo-Pacific Poriferan, Suberites carnosus. Photo Credit: Zachariah Kobrinsky and David Liittschwager. CRINCH! 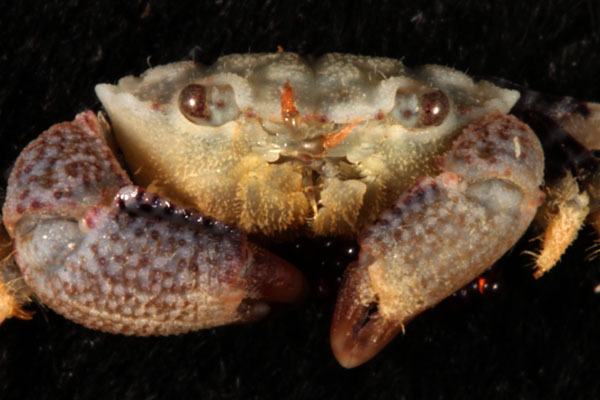 #CrabOfTheDay for 08/13/2017: Serenotheres janus, or The Two-Faced Pea Crab is an recently discovered species of Pinnotheridae “pea crab” found so far, only on the Solomon Islands. 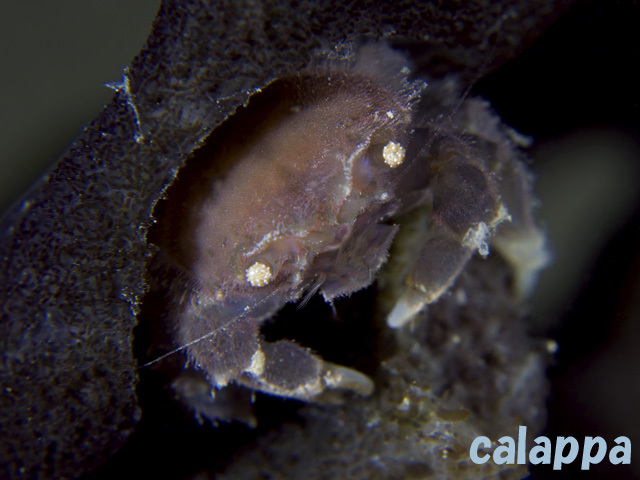 Only inhabiting the breathing mantles of the Date Mussel, Leiosolenus obesus, these tiny semi-parasitic (not quite symbiotic) crabs are one of only two members of genus Serenotheres (the other being Serenotheres besutensis from Malaysia) or double-plated carapace pea crabs. Because the additional carapace plate on these crabs gives them the appearance of having two ‘faces,’ S. janus, was given a Latin suffix named after the Roman two-faced god, Janus. CRINCH! 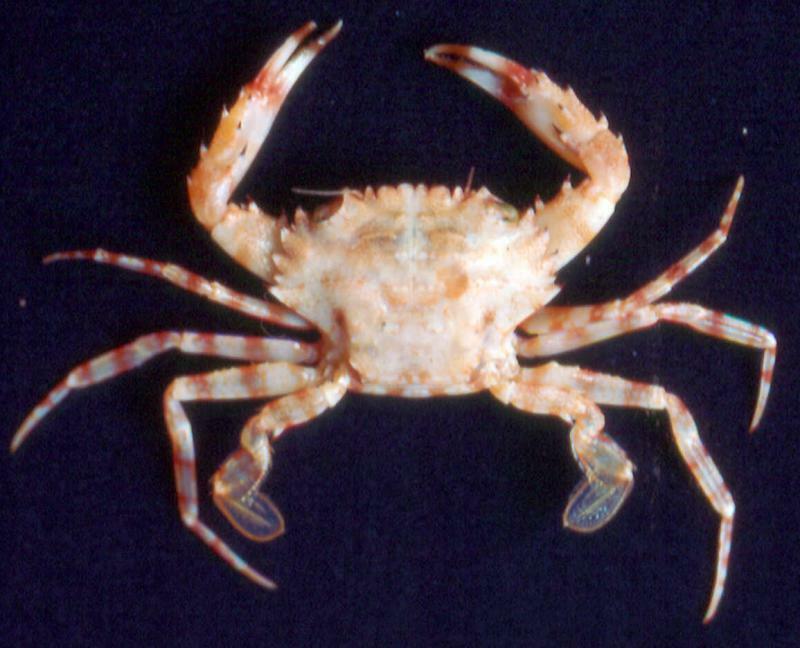 #CrabOfTheDay for 08/14/2017: Liomera laevis, or The Pie-Dough Crab is a Milne-Edwards classified Indo-Pacific species of family Xanthidae crab. 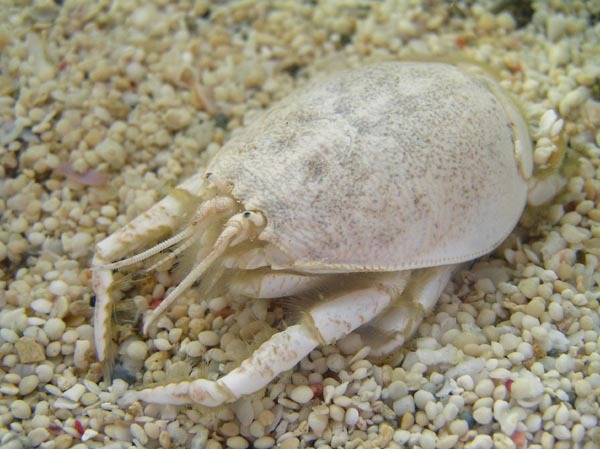 Named for its ‘doughy’ appearance, this crustacean is also called “Hime-beniohgigani” in Japan, (ヒメベニオウギガニ) and “Guānghuá huābàn xiè” in (光滑花瓣蟹) Taiwan. A shallow rockbed dweller, L. laevis hs a fine, granular texture to its carapace, giving further visual similarity to an uncooked pie crust! There is one subspecies of this crab observed, Liomera laevis odhneri, and 31 (+/-) species in the genus Liomera as a whole. CRINCH! #CrabOfTheDay for 08/15/2017: Epigrapsus politus, or the Common Brown Crab is an Asiatic (and French Polynesian) species of semi-terrestrial/intertidal family Gecarcinidae crab. Dark chocolate brown to caramel, this obviously named species is called “Yaeyamahimeokagani” in Japanese. (ヤエヤマヒメオカガニ) As is the case with other Gecarcinids, Males usually have one claw larger than the other. All genus Epigrapsus crabs are omnivores; they usually stick to leaf litter or detritus, but will readily eat worms, bugs, and smaller aquatic life. Photo Credit: Rubén Arturo Guzmán. CRINCH! #CrabOfTheDay for 08/16/2017: Pilumnoides inglei, unofficially nicknamed ‘The English Channel Pilumnoid,’ is a species only recorded on the South coast of England/North France, irregularly in other European waters, and as an alien transplant in Ireland. The earliest specimens of P. inglei were collected by collected by Rupert Vallentin and were found as ‘stowaways’ on derelict boats. Originally misidentified as both Pilumnoides perlatus and Pilumnoides rubus, Guinot and Macpherson designated the English specimens as a new species, in their 1987 revision. P. inglei is in-part, named after Ray W. Ingle, Natural History Museum curator, and author of all things crab! CRINCH! #CrabOfTheDay for 08/17/2017: The Akragas (Sicily) Crab Didrachm Coins! Did you know crabs featured prominently on the ancient coinage of Greece and Sicily? “Akragas” an affluent and militarily strong South-Sicily Grecian state began stamping coinage called Dekadrachm ("Demareteion") from about 415 BCE on, with elaborate animal motifs, namely Eagles and Crabs! The fresh-water crab usually depicted on silver ‘Obol’ coins symbolizes the Akragas River and its associated god, and was typically used as the emblem of the Navy.